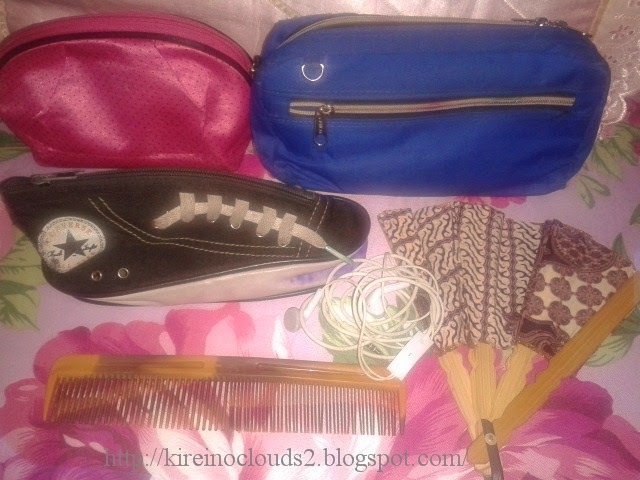 I was read ate rica blog post about what's in her bag here. I think it's interesting and decide to do mine. This is my daily bag from Elle. 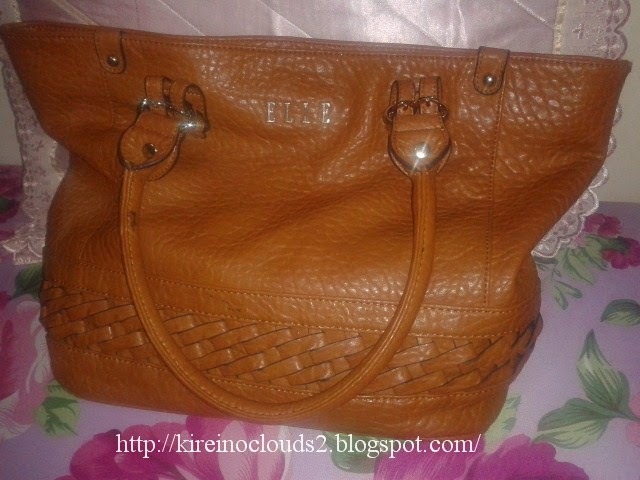 And to be honest I didn't use designer bag because I can't afford it (>_<). 2. Bag organizer that become my purse too. 4. Comb (I know it's look like old granny comb but I dont know why I really love it..haha..). 4. Hand fan (Indonesia is super hot, need it when I have to stuck in a room without AC). 5. Handphone (I use it to take this picture). 1. Elianto natural mineral powder. 2. ZA powder (I need its mirror but not use this powder daily). 3. Skinfood black bean eyebrow pencil. 4. Etude Draw me eyebrow pencil. 5. Revlon lipstick on mauve it over. 5. PAC lipstick on ripe apple. 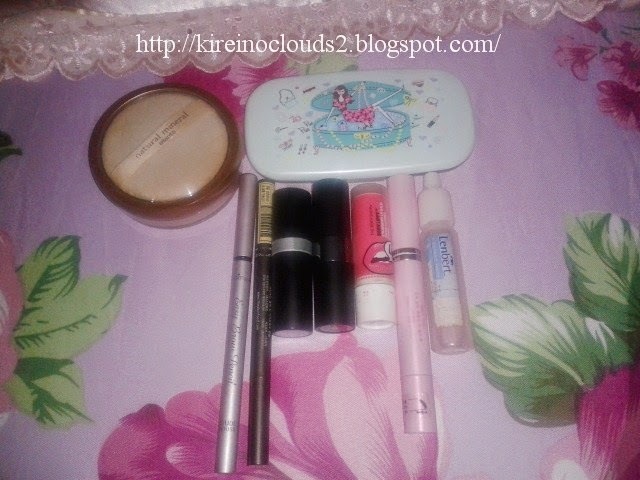 I know I got lots of lips product in my pouch but to be honest I rarely touch up my make up. well if I want to be really honest then I have to say that I'm pretty much not use make up on daily basis. I'll use make up if I know I need to go out from office. But my make up will only consist of powder, eyebrow pencil, lipstick. I dont think if out there any other beauty blogger that not wearing make up in daily basis like me XP. I'll use proper make up when I have to attend event or party. Sometimes when I hang out with my friend I'll use proper make up too. Anyway I really enjoy this tag. And I hope you all enjoy to read my post too. If any of you do this tag too, let me know about it. Last, I want to tag all of you that read this post to do this tag ^^. Oh my your bag is so organized, inside my bag there is totally chaos :/ Thank you so much for dropping by my place and leaving such a nice comment. And of course I follow back on GFC #22 Please keep in touch. I don't use designer bags as well. Haha. First, I can't afford it. Second, I think I will look overrated with it. Hehe :) I prefer cheaper bags with good quality. as long as it got a good quality then I'll go with it :). I love the converse style bag. Amazing post! actually it's my daily lipstick too! it have a beautiful colour for daily wearing :). You are so well organized! hahaha, itu pencil case ku. Iya, casingnya cute n limited edition. makanya pas sempat di minta sama org kantor aku ga kasih (>.<). love that brown bag! look so cool. Thanks dear, I'll following yours ^^.